This new handmade flatwoven Sumak is from Turkey. "New" in rug time could be up to 25 years old. This is unused and in great condition. It has a red brick background it s geometrics and shades of white , greens and brick red. 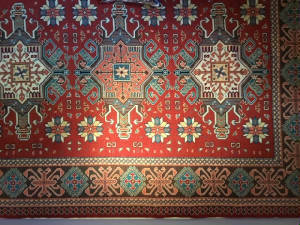 Sumaks/Soumaks are a rare and special type of flatwoven rug. It is a unique type of weave and embroidery. Sumaks are a great choice for high traffic areas. Free shipping in the U.S. from Pasha Rugs. If you feel more comfortable processing your order over the phone, just call our store 609.397.5434 and we will happily serve you!